Prominently displayed on Waugh Drive, Pueblo Bonito consists of Cor-Ten steel, which has been allowed to weather in the open air. It is the creation of Charles Ginnever. Mosher Steel is listed as the foundry where it was made. 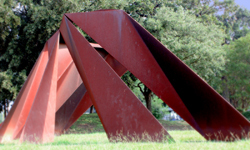 It was donated to the City of Houston by the Robert W. and Pearl Knox Foundation. Charles Ginnever is a native of California. He studied sculpture at the Academie de la Grande Chaumiere in Paris and has produced sculptures that are on display across the United States and internationally. 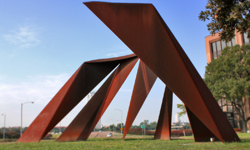 In Houston, his displays include Troika on the University of Houston campus, as well as Pueblo Bonito.